The deployment of healthcare kiosks is providing opportunities to improve the quality and delivery of services. Patient check in kiosks are being utilised in surgeries and hospitals to manage patient flow issues. As one of the most time consuming processes, signing in upon arrival is being made simpler and more efficient. Patients can choose from interacting with a touch screen and entering their details or scanning a barcode on their appointment letter. These applications are being used to minimise queuing time for patients and reduce paperwork, which frees up time for staff. As a result, kiosks can reduce administration costs. Another benefit of self-service check in is that it allows for more accurate data input, creating less room for error in patient details. 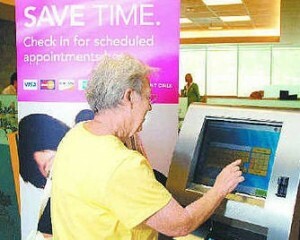 Automated booking kiosks allow patients to make and view appointments without interacting with a receptionist. Recent research has shown that patients are becoming increasingly anxious about waiting times in hospitals and doctors’ offices. This research has also highlighted that 72% of patients are more likely to choose a healthcare provider that offers the opportunity to interact with a self-service application. Kiosks in healthcare are benefitting patients through providing digital maps and on screen directions to appointment locations in large hospitals. The directions can be printed from the kiosk or sent to the patient’s Smartphone via email. These wayfinding applications also help to manage patient flow in simplifying information and reducing late arrivals, which contribute to streamlining the overall appointment process. Screens and digital signage are being utilised by healthcare providers to display information. The advantage of using screens is the information can be easily and instantly updated, improving delivery of announcements and overall communication. Digital signage can also benefit healthcare providers by being utilised to advertise for pharmaceuticals. Cammax kiosk solutions can be utilised in healthcare to improve services and enhance patient experience.